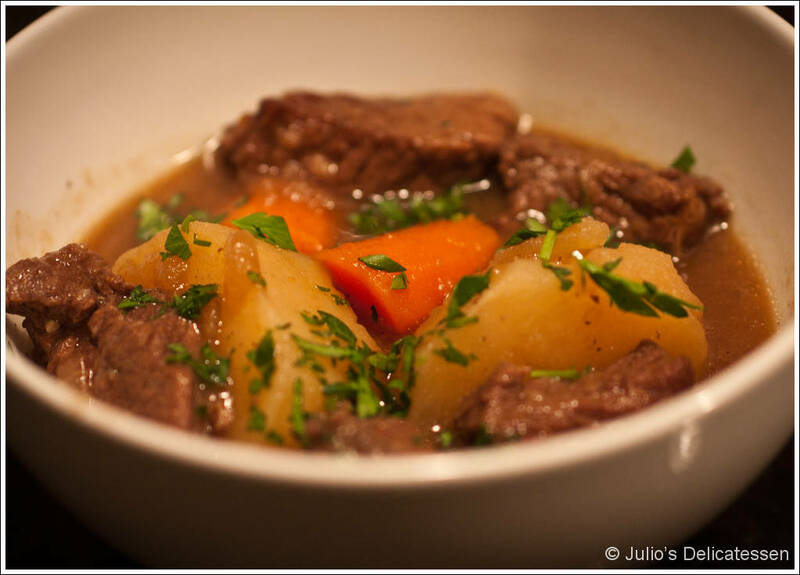 Okay, okay, I know that authentic Irish stew is supposed to be made from mutton or lamb, but everyone in my family prefers beef. This may not be authentic, but it is delicious. I say below that it can be refrigerated for two or three days, but I should probably say that it *should* be. This is a dish that improves significantly in the fridge, and is much better on the second day. Preheat oven to 300 degrees. In a large Dutch oven, heat some oil over medium-high heat until almost smoking. Dry the meat with paper towels, then season heavily with salt and pepper. Brown the meat on all sides, working in batches to ensure the pan remains hot. Transfer to a platter as you work on the remaining batches. When all of the meat has been browned, make sure you still have some oil in the pot and turn the heat down to medium-low. Add the onions and some salt. Stir for about a minute to ensure the fond releases from the bottom of the pot. Allow to cook until the onions release some liquid, about 5 minutes. Increase the heat to medium and add the flour and garlic. Cook for about 4 – 5 minutes. Add the beer and beef broth, stirring to combine and making sure to get all of the fond off the bottom of the pot incorporated into the broth. Add the beef (with any liquid that has accumulated). Bring to a simmer, then cover with a parchment lid and transfer to the oven. Cook for 1 hour. Remove the parchment lid and add the carrots and potatoes. Stir to combine. Add more water if required, then re-cover. Cook for another 1 – 1.5 hours, until meat is tender. Can be served immediately or refrigerated for 2 – 3 days and reheated. Best stew I ever ate and thanks for the beef (and the leftovers). It really was the best stew I ever had. Even better the next day. I kept making yummy sounds while I ate it on my couch, mostly to make my roommate jealous since I wasn’t sharing. If inrfomaiotn were soccer, this would be a goooooal! Amazing stew!! I had some of my leftovers tonight & am so excited I have a little for tomorrow too – Yum!